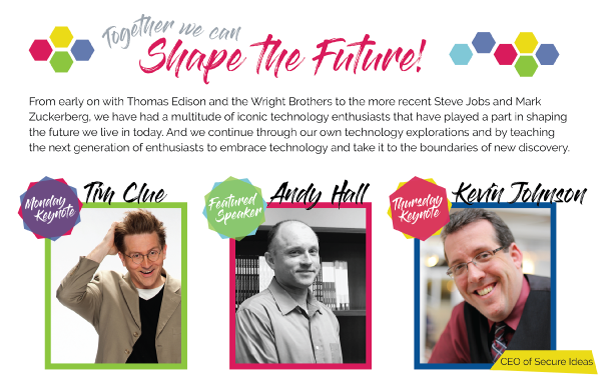 Our lineup of keynotes and featured speakers for this year’s conference is going to be our biggest yet! We are finalizing a program for Wednesday and Thursday that will have more thought provoking discussions, out-of-the-box strategists and technical experts to give you the biggest return on your attendance. Here is a sneak peek of what you can expect at #MOREnet2018. Breakfast Keynote – Ian Polhemus and Bear, the electronics-sniffing police dog. Ian is an FBI consultant, Bear is his dog, the dog that discovered Jared Fogle’s (Subway spokesperson) hidden USB drive that landed him in jail. Travis Newkirk, Program Manager for Enterprise Risk Management at H&R Block will be discussing Business Continuity and Disaster Recovery and answering questions on how H&R Block handles Crisis and Risk Management. Dustin Loeffler, Associate Professor of Cyber Security and Information Systems was referred to us by Apple Corporate and will be speaking on our favorite subject- cyber security. Scott Summers, Director of School Laws for MSBA will be back to discuss school employees, social media and the first amendment. Breakfast Keynote – Kevin Johnston, CEO of Secure Ideas will walk us through a variety of real world cyber security attacks that travel through the Internet and target all of our organizations. Andy Hall will repeat his Tuesday session for our Thursday audience, an in-depth look at how Platte County R-3 is using Raspberry Pi for everything from security alert buttons for staff to hands-on student projects.